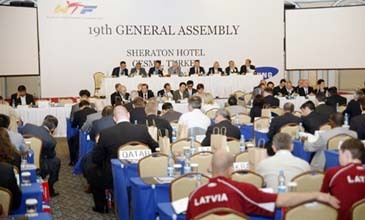 The WTF General Assembly is under way at the Sheraton Hotel in Cesme, Turkey on May 6, 2007, on the occasion of the 7th WTF World Junior Taekwondo Championships. The World Taekwondo Federation held its General Assembly in Cesme, Turkey on May 6, 2008, and unanimously adopted the 2009 edition of the World Anti-Doping Code. With the adoption, the WTF became the second International Sports Federation after the FINA, showing its strong determination against anti-doping rule violations. The code will be implemented on January 1, 2009. In addition, to align its anti-doping administration with the standards established by the WADA, the WTF approved three Abbreviated Therapeutic Use Exemptions applications via the ADAMS, which is an online management system by the WADA. At the General Assembly, the WTF also voiced its full support for the International Olympic Committee's Youth Olympic Games, whose first edition is scheduled for 2010 in Singapore. Mr. Pierre Ducrey, sports operations manager of the IOC's Summer Games Sports Department, made a presentation on the Youth Olympic Games for the participants of the WTF General Assembly. Participants in the General Assembly also received presentations on the WTF's new membership system and the WTF's Web TV and E-newsletter projects. They were briefed on the WTF's "Taekwondo Peace Corps" program. The WTF General Assembly took place at the Sheraton Hotel in Cesme, Turkey, one day prior to the 7th WTF World Junior Taekwondo Championships. The Izmir championships will take place at the Halkapinar Sport Hall in Izmir, drawing a record 84 countries. "The WTF General Assembly was a great success for good reasons. Among others, we are happy to adopt the 2009 edition of the World Anti-Doping Code," said WTF President Chungwon Choue. WTF President Choue said, "Our strong support for the IOC's Youth Olympic Games and our Taekwondo Peace Corps program will combine to further promote the Olympic Movement." Fully sharing WTF President Choue's positive evaluation of the WTF General Assembly, Mr. Phil Coles, an IOC member from Australia and vice president of the WTF, said that "the WTF General Assembly was a great success and the participants gave full support for the WTF President's leadership." At the General Assembly, Mexico won the honor to host the 2010 WTF World Junior Taekwondo Championships in the state of Baja California. Mexico and Azerbaijan were the two candidates for the 2010 World Junior Championships, but Azerbaijan withdrew its candidacy for the unity of the global taekwondo community at the last moment. Azerbaijan, instead, earned the right to host the 2009 WTF World Cup Taekwondo Team Championships, as South Africa withdrew its candidacy at the last moment. South Africa's Sun City was the only candidate for the 2009 World Cup. A ranking Azerbaijan taekwondo official said that his country considers organizing the 1st Paralymic poomsae event, on the occasion of the 2009 WTF World Cup Taekwondo Team Championships. President Choue announced at the meeting that Turkey will host the 3rd WTF World Taekwondo Poomsae Championships in December this year. The inaugural WTF World Taekwondo Poomsae Championships were held in Seoul in 2006, and the 2nd championships in Incheon, west of Seoul, in 2007. The President also reported to the General Assembly that taekwondo poomsae (fixed forms) will be on the official program of the 2009 Universiade in Belgrade, together with taekwondo kyorugi (sparring). At the General Assembly, five countries were officially accepted as full members of the WTF, thus raising the WTF membership to 188. They were Gambia, Malawi, Marshall Islands, Montenegro, and Uganda. WTF President Choue said that five more countries are proceeding to become new WTF members. Participants in the General Assembly received a progress report from the Organizing Committee of the 2009 Copenhagen WTF World Taekwondo Championships scheduled for Oct. 9-19, 2009, in conjunction with the IOC Congress and Session in Copenhagen. WTF President Choue told the General Assembly that the WTF will hold an Olympic coach training seminar in Busan, Korea, on June 16-18, 2008, and an Olympic referee refresher course in mid July in Korea. A day earlier, the WTF held its Council meeting, in which it approved in principle the enactment of the WTF Code of Ethics.